Okay, back to what made us busy . . . Remember in my last post that I was spending a couple of weeks staying down with Jim and Jill? Enjoying the summer off from work and swimming in that big swimming pool when I wanted and making movies/DVDs with the grandkids. Awww, it was nice. Unfortunately for Bill, he was stuck back at home working and it was a very hot summer. One day he called me and said that the AC had gone out at home. This was the project that was not pleasant (at least for Bill). In between working, he called and had repair people come out. Poor Bill. Bill likes hotter weather. So, when he said that it was so hot and humid and he had a hard time sleeping, I knew it was bad. I had no desire of coming back home and experiencing that with him. Long story short, we not only had to replace the AC, we replaced the whole heating and AC system! Turned out our furnace had enough rust to call for having it replaced, too. It was not a cheap fix, either. We ended up going with a high-efficiency system because there was a $1500 federal tax credit and we also got in on a tail-end refund from the state. And, this was right before we were going on our family vacation to the beach. What are you gonna do? It had to be done. We hoped that would be a good selling point for the house when it went on the market. Needless to say, we had no idea that was just the first of costly home repairs to come. Remember this for future posts. Taking a break from all the house-building (Jill and Jim) and house-repair (us) and every day busyness of work and family (Bryan and Vicki), in late July, we headed to our favorite way to spend fun family time together – a trip to the beaches of North Carolina. Spending family vacations at North Carolina beaches was a tradition we brought back from many years ago when we use to vacation with my sisters and their families when our kids were growing up. 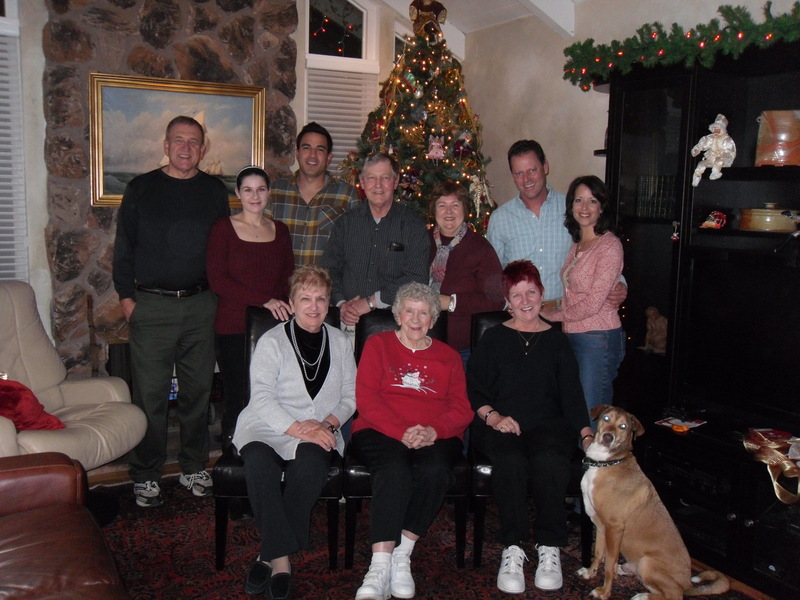 Bill and I wanted to spend time together with our children and their spouses and grandchildren. So, we started having family vacations at the beach every other year. 2010 was our last family vacation. I miss spending time with everyone under one roof. This was a great vacation for all of us. In addition, I really liked the upper floor layout of the house (open floor plan and separate master bathrooms and closets) and thought maybe we could incorporate some of the home’s features in our new house. Bill and I also invested some money into a utility vehicle for our new place. Or, at least, that’s what we said. We sure have had a lot of fun with the Gator here, too! It’s so much fun to drive! Late summer we made another trip down to see the progress on Jill & Jim’s house and to cut grass. Windows and doors had been installed and the roof was on. In addition, Jill & Jim did something unique before the dry wall went up. They invited their bible study group to come out to the house and write scripture on studs throughout the house. It was their way of blessing the house. I loved this idea. Fall of 2010 brought two more trips for me and departure from thinking about my upcoming retirement and trying to settle on a house plan for us. 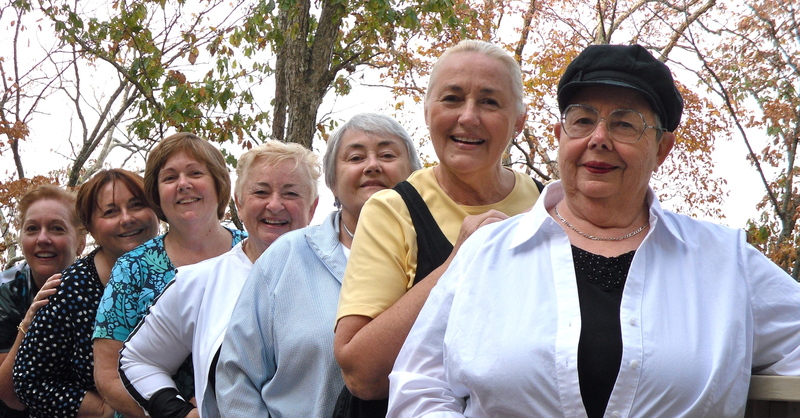 The first trip was my annual sisters’ weekend (WOW Weekend) with my six sisters during the beginning of October. That year we went to Cadiz, Kentucky, and rented a wonderful house on a lake and had a great time (as usual). 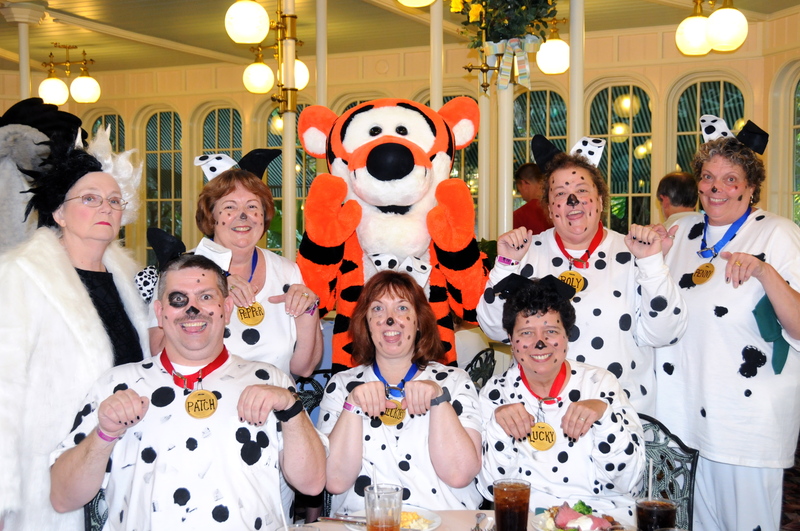 The second trip was at the end of October when I went with my close friends down to what has become an annual fall break at Walt Disney World. I love being with my sisters and I love being with my friends. We laugh a lot. It’s good for the heart. It’s good for the soul. It’s just not good for the waist line cause we all like to eat during these trips! If that wasn’t enough trips in one year, Bill and I traveled to California in December to celebrate his aunt Edie’s 90th birthday. Not sure if I’ll make it to 90, but if so, I want to be as spry as Aunt Edie! Next up, the year of my retirement! 2010 was the start of new beginnings for all three families. Where most of the excitement, trials and tribulations involved Jim and Jill and Jim’s parents, Bill and I, you might say, listened and learned. Jill & Jim ended up putting a For Sale by Owner sign in their yard sometime after the first of the year – might have been February. They thought they’d give it a try before listing it again with a realtor in the spring. Turns out they ended up selling it! Perfect! After finalizing all the details of the sale and when they needed to move, their craziness began. Were the house plans and all the specification documents up to date to send out bids? When would they start building the new place and how long would it take? Where would they live? Where would they store all their furniture and belongings? Decisions, decisions! All of these are in our future and I have to admit I’m not looking forward to some of it at all. Spring 2010 ended up being a wet time to dig a driveway. There were many many delays and lots and lots of rock to be laid. While waiting for the driveway to get done, Jill & Jim ended up moving into a large rental home. It was a great place which had an extra bedroom and bath for guests and a large swimming pool, too! I ended up spending a couple of weeks down there that summer. The one drawback about renting this house was they were putting it on the market, which meant J&J would have to allow for house showings and risk having to move again if the house sold. While J&J were having their driveway dug out, we decided to have some trees removed on our property down by the lake since they were blocking our view. In addition, we had them take some of the ground from the driveway and had it added to our yard to help with leveling the slope of our property. Another big thing was having drainage pipes installed all along the front of the property by the road to get rid of the big ditch. 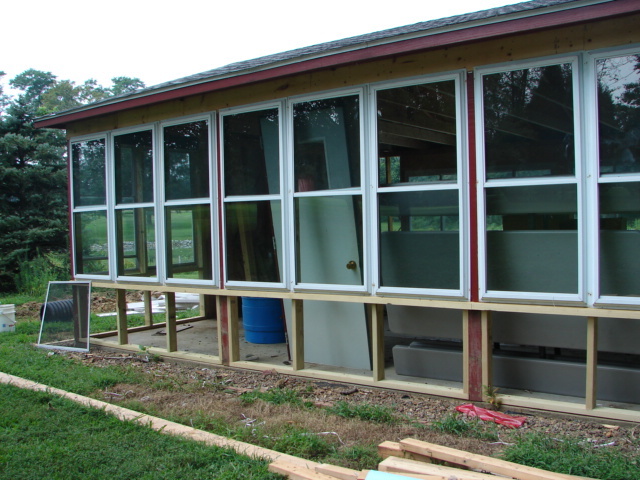 By the first of June, Jim and Jill’s house started to take form. Jim’s parents began building their home sometime that summer, too. I was glad I spent two weeks down there that summer so I could see how much took place in a short period. Here are pictures from June and July, 2010. Surveying, Plats, Purchase Agreements, Closing, Etc. It was a whirlwind of activity after the land was purchased. Mainly for Jim. He surveyed the whole 25+ acres and drew up all the necessary documents and filed all the necessary paperwork to divide this property up the way the three families wanted it. I have a whole folder of emails sharing information back and forth until the closing on November 17. It was determined that Bill and I did not have to attend the closing and were able to overnight all our documents along with our certified check to pay for our new property. Doing that saved us another day off work since it was a Monday morning closing. Spring of 2009 brought a new life not only to the property but to all three families. Jill & Jim decided to put their house on the market in April of 2009 – right smack in the middle of the recession. And we made several trips down to just explore and enjoy our new property with Jill/Jim and the grandkids and Jim’s parents. We enjoyed fishing, cookouts, watching the kids climb trees, scoping out a place for Bill to build a tree-house for the grandkids, finding blackberries, and cutting grass. As the year went on, unfortunately, Jill and Jim’s home did not sell and they took it off the market for the winter after a six-month run. During that time they worked on drawing up plans for their new home on the hill. 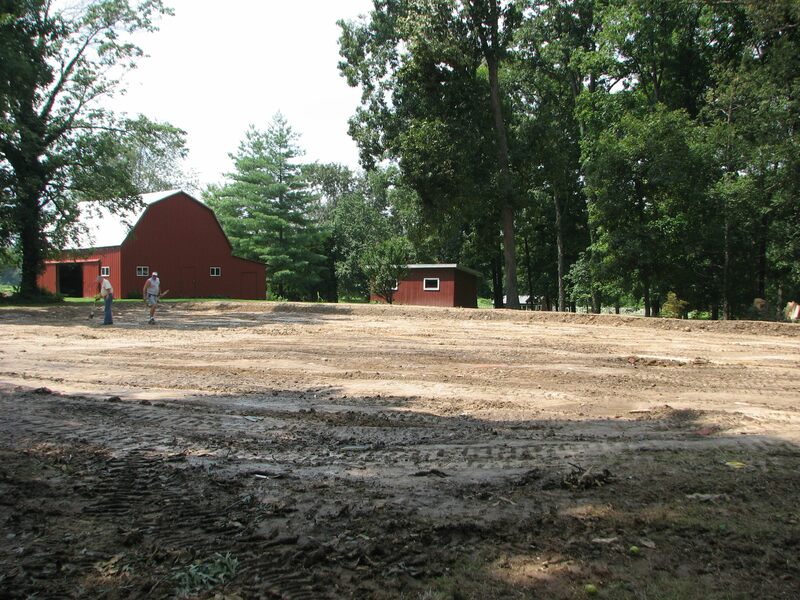 In summer of 2009, there were some changes happening to what we were fondly calling “our family compound.” The changes happened on Jim’s parents’ property. 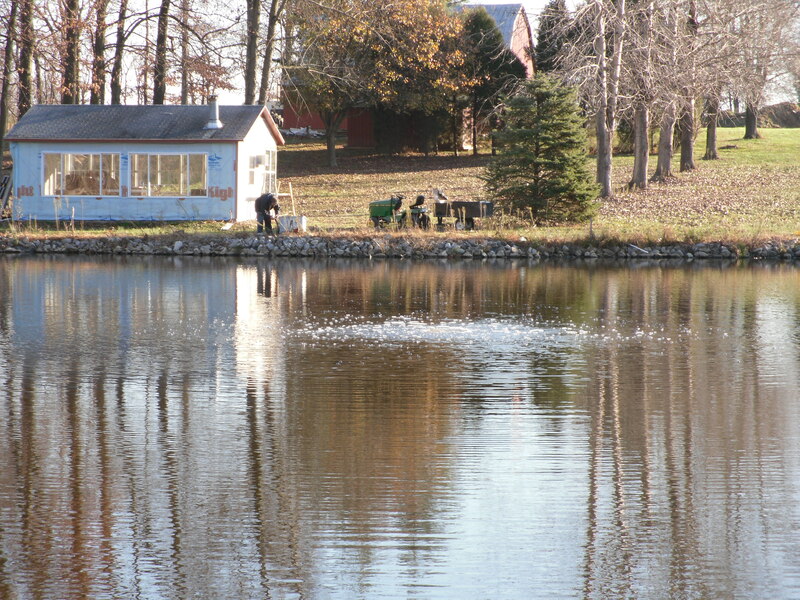 They decided to demolish the old house on the property and started work on updating the lake house. In the meantime, I searched every Internet site I could find to look at one-story house plans. I purchased tons of books on building homes, designing kitchens and baths, and every Sarah Susanka book she wrote about the Not So Big House (thanks to Jill introducing her philosophy to me). We were still several years away from building, but I’m a planner and it was never too soon to start. 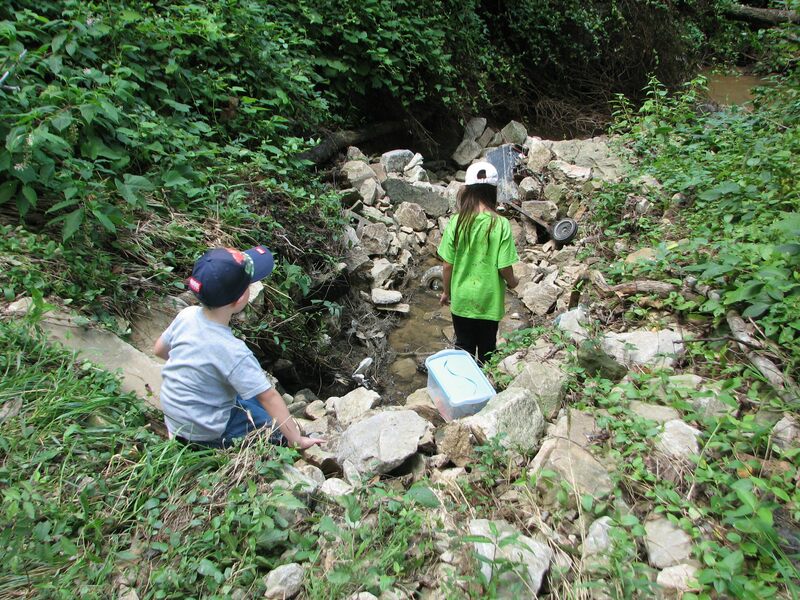 The grandkids explored the property every time their parents or grandparents drove out there. There wasn’t much else to do except explore at that time. This was different from their life living in a subdivision with friends next door or across the street. Megan is the adventurous one of the two. Soon they named one area of the creek that runs through their property Junk Creek. Wonder why? 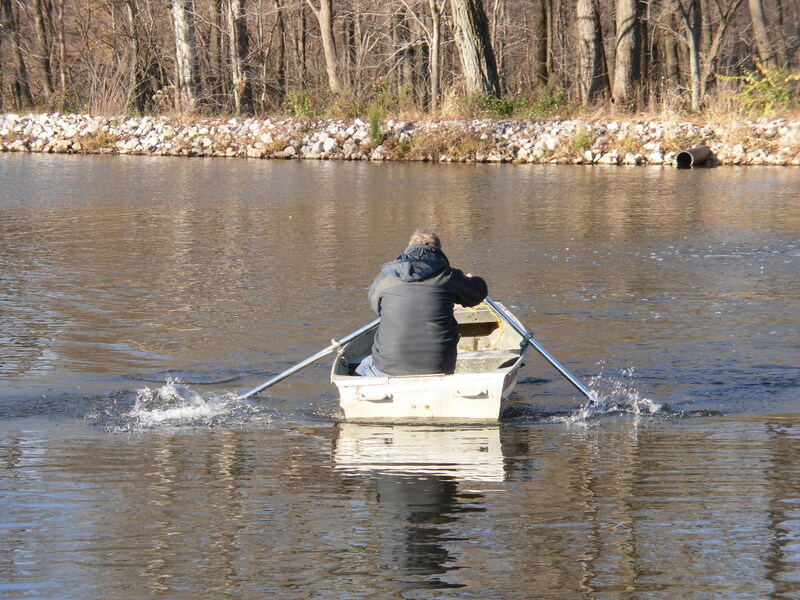 Bill did his share at the compound at the end of 2009 by making and installing an aerator for the lake in hopes of improving the quality of the water. The question was . . . “How would you like to live next to Jim’s parents?” Huh? At first I had no idea what Jill was talking about. However, thankfully she picked up on the silence on the other end of the phone and quickly proceeded to tell me what had happened after we left the auction showing. I don’t remember the sequence of how it all came about or what was discussed, but apparently Jim and Jill did eventually talk to Jim’s parents about the property sometime between when we left the auction and before this phone call. All I know is that they did go out to look at the land and decided they would be interested to go in with Jill and Jim and us and see about purchasing the whole 25+ acres. Really? I quickly told Jill that I would love to have Jim’s parents as neighbors as we get along with them so well and spent many a holiday with them. But, I did say I better check with Bill before answering for both of us. (Of course, when I talked with Bill later that night he was in agreement that it would be great having all of us living close to each other.) And, it must have been okay with Jim’s parents to have us as neighbors or else they wouldn’t have even gone this far, right? So the questions started surfacing. What do we do next? How does a land auction work? How are we going to bid? How much money do you think it’s worth? Do you think we even have a chance at winning the auction? We only had one week before the auction date – Tuesday, October 7 at 6:00 PM. Earlier in the summer, Bill and I had made some arrangements for $$$ to purchase land. The rest of the group would quickly make their financial arrangements. Then, we hatched a plan. The first part of the plan was to decide which area of the whole 25+ acres would each of us be interested in buying. Turns out each couple wanted a different part of the acreage as their first choice! Yay, maybe this was going to work out after all. Bill and I were only interested in the 2-1/2 acres in the front of Tract 1 which included part of the lake. Jim’s parents were interested in Tract 2 and 3 (5+ acres) which included all the buildings on the property and part of the lake. Not sure they wanted that house, but it came with Tract 3. Jill and Jim were interested in all the back farmed acreage of Tract 1 (18+ acres). The second part of the plan was to determine the maximum amount of money each couple would be willing to pay for the land they wanted. The third part of the plan was to agree to pool all three maximum dollar amounts together in order to bid on the whole 25+ acres. Verbal agreements were made via many phone calls. 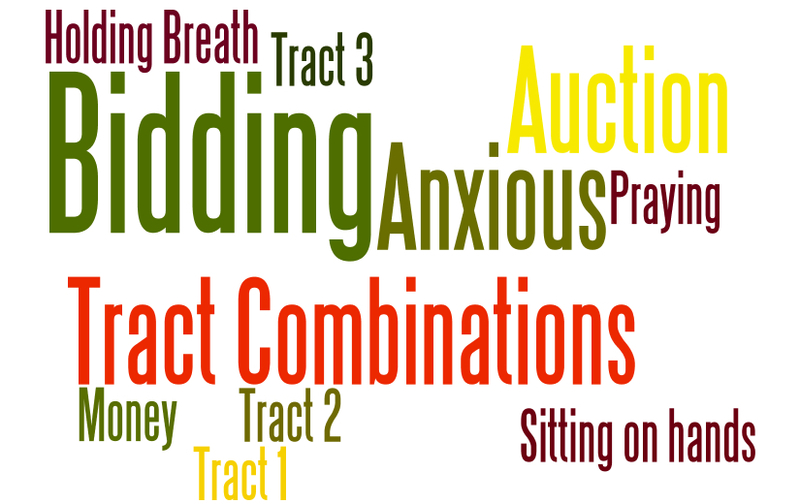 The process starts by using the traditional auction format to take bids on the individual tracts. Once all of the bids are posted, the auctioneer will ask the gallery of bidders for bids on combinations of two or more tracts. If a bidder would like to create and bid on a combination they simply add the bids posted on the individual tracts together and raise the bid above that price. Then the individual tract bidders are offered the opportunity to raise their bids in order to retain the lead on the individual tracts. If at any time a bidder would like to bid on the entire property they simply bid on all the tracts. This process continues until the bidding stops and the property is sold. Bidding results are tracked and displayed on large screens. And, I prayed and prayed and prayed that week. My prayer was, “Lord, if this is the direction you want our lives to go then let us win this land auction. If it is not the direction you want us to go, so be it.” And, I actually felt at peace with that. After praying that prayer over and over again up until the auction started, I knew the decision was out of our hands. That didn’t mean I was any less anxious, but I felt okay no matter which way it ended. We drove down to Jim and Jill’s house on that Tuesday afternoon of the auction. It seemed like the longest trip we ever made down there. Jim’s dad met up with us and we drove to the County 4-H Center for the auction. As soon as we pulled in we noticed a lot of cars. Oh no, that means a lot of people are interested in this auction. We went inside and the place was filling up. The front row of seats was empty. Jim signed us in and the five us took our seats in the front row. We found out later it’s better to sit in the back so you can observe everyone in front of you during the auction. Oh well, there were no seats in the back. Jim sat on the end of the row by the middle aisle, his dad sat next to him, then Jill, then me, then Bill. I decided I would sit with my hands under my thighs once the auction started because I have this bad habit of using my hands when I speak and didn’t want to cause someone to think I was bidding. The auctioneer started to explain the proceedings of the auction and before we knew it, the auction began. First up was Tract 1. Slow start and then some bidding started. Our row was quiet. Bidding stopped for Tract 1 at an okay price. My heart was racing. Bidding started for Tract 2. Hardly anyone bid on Tract 2 and ended very low price. Then, bidding started for Tract 3. Again, slow start and few bidders. Our row was quiet. Then the combination of tract bidding began. This took a little longer. People would group together. I got my nerve up and turned around a couple times to see what was going on. Jim told us the gentleman who owned the property behind this property was there. Maybe he was interested in bidding. Nerves were on edge. I would love to say that with those words the property was ours . . . but it was not . . . at least not yet! We did not hear the words, “The property is sold to number bla bla bla.” We were wondering what would happen next. I wanted to be excited, but I didn’t know what eventually would happen. Everyone was told to leave the 4-H Center except us. When the place emptied out the only people left was a group in the back (which we found out was the seller’s family members), us and the auctioneer group. The auctioneer went back to talk to the seller. The five of us anxiously gathered around to discuss what could be going on. The auctioneer approached us and told us that even though we were the highest bidders, the dollar amount was not at the seller’s lowest agreed amount. He asked us to talk it out among us and decide whether we wanted to come up with a higher amount to offer the seller. We agreed on a higher price and called over the auctioneer. He then went back to the sellers to discuss the higher bid. Now, we’ve done counter offers before when we’ve purchased a house but never when the seller was right in the same spot as us. It was different and a little awkward. 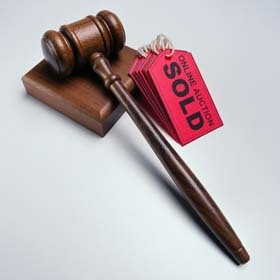 Soon the auctioneer came back to us again and said the seller would not accept our last bid. We re-grouped again. I remember Jim and his dad talked about it a lot and Jim’s dad didn’t want to go up any higher. Finally, Jim looked at all of us and asked if we were willing to throw this all away even though we had not even reached our maximum we said we would pay for the property. We all agreed that we were not going to let it go. We came up with our last and final bid and the auctioneer took that info to the sellers in the back of the hall. We waited. 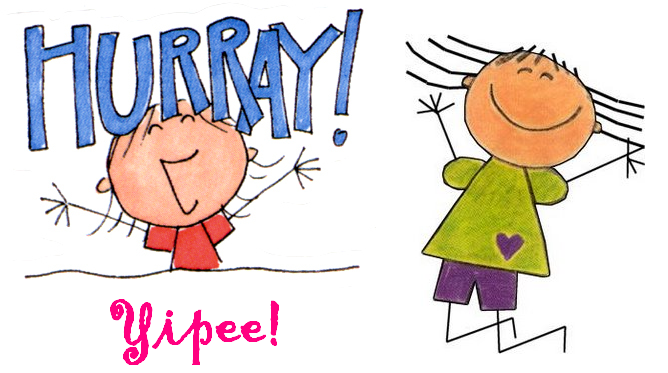 Then all of a sudden we finally got the news that the seller accepted our offer. We then talked with the seller (an older gentleman) and his family members. They were happy for us but sad to see the property go. We all said we would take good care of the place and we all planned to build homes on the property. They were pleased when they heard that. While we were putting down our deposits on the land Bill went outside and found some people were still hanging around waiting to see how it all ended. One of the guys was the one who was bidding against us. Turns out this gentleman’s family had owned the property years ago before they sold it to the seller. He actually lived right next door to the property. He was going to be our future neighbor! He did come in and congratulate us afterwards. Bill and I had to part from our group to head back home. It was another long 3-1/2 hour drive. But, this time, boy did we do a lot of thinking and talking and dreaming on the way home. After hearing nothing but positives from our son-in-law about the property to be auctioned, Bill and I got excited. All Jim kept telling us was that it was such a gorgeous piece of land. Now, remember our son-in-law is a land and surveying engineer. He knows his way around land. If he thought it was nice and had possibilities, we were encouraged. We planned our trip down to Evansville for the Sunday, September 28 showing. Honestly, looking at the proposed tracts in the auction photo, we were struggling at which tract(s) of the three we might be interested in purchasing. 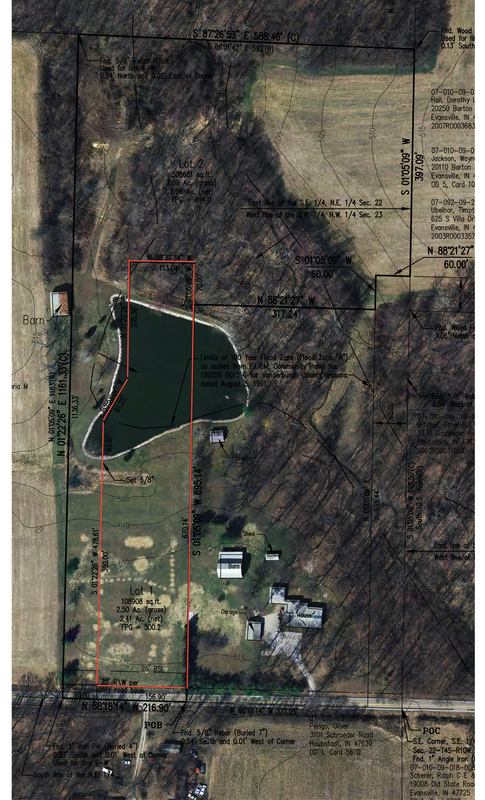 Tract 1 was 20+/- acres of tillable and wooded acreage with lake access. We liked the front section of Tract 1 and loved the lake access. However, we really were not interested in all those acres behind the woods. Tract 2 was 2.7 +/- acres mostly wooded with a shelter house and lake access and 60 ft of paved road frontage. This tract didn’t sound bad, but I’m not a “live in the woods” person. I love sun and lots of natural light. And, it might be strange living behind another house. 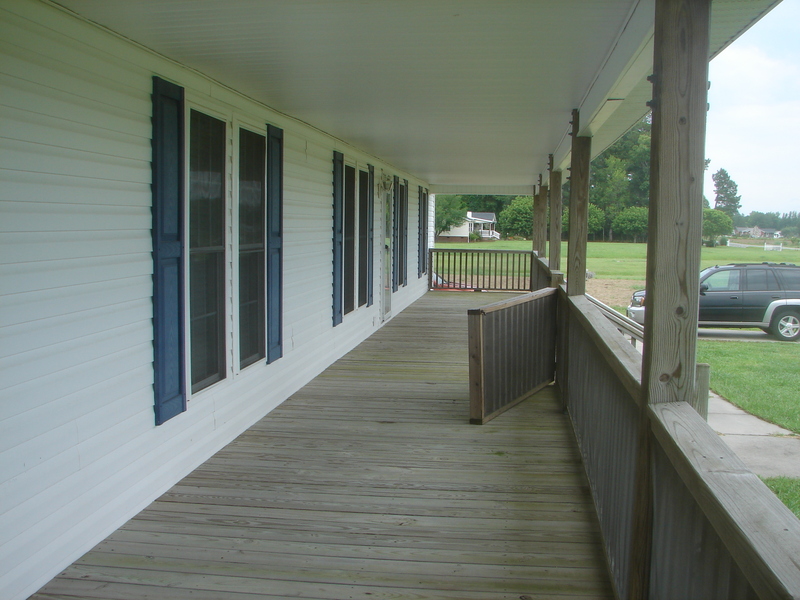 Tract 3 was 2 +/- acres with a 2727 sq ft one story brick and siding home, detached garage, and a 40×30 classic metal-sided barn with 11 ft lean-to. We really were not interested in this tract because we did not want to maintain buildings for several years before we were ready to build. Sometime before the showing Jill and Jim both went out to the property to look around. I remember Jill calling us saying that there would be a remote possibility that they might also be interested in part of the property. Really? In fact, they loved all the acreage behind the woods. At that time the back acreage was being farmed out and the University of Evansville’s cross-country team was using part of the north end for their course. Jim & Jill were already envisioning living at the top of the gradually sloped 18+ acres. Problem was – a couple years prior to this they and Jim’s parents had purchased land next to each other for future homesteads. Jill said she didn’t know how they could possibly change those future plans without hurting relationships with Jim’s parents. We fully understood. We love Jim’s parents and consider them part of our family. So we went with the plan that we would come down and look at the auction property for us alone. The property was being shown to the public on two different dates – Sunday, Sept. 28 from 2:00-4:00 PM and Tuesday, Sept. 30 from 4:00-6:00 PM. We chose the Sunday, which ended up being a beautiful fall day. Jill and Jim left the kids with Jim’s parents and the four of us went to view the property first hand. We walked the whole 25+ acres of the property and fell in love. Our problem was . . . we fell in love with all 25+ acres! But Bill and I knew we couldn’t take care of all that acreage and we really didn’t want that house that was on the property. It was old and had been built onto several times. And, the most important thing was, we knew we’d never be able to afford to buy the whole thing anyway. By the end of the afternoon, Jill and Jim were acting as if they still would be interested in part of the property. Since we much prefered the front section of Tract 1 over the wooded Tract 2, Jill & Jim were thinking that maybe there would be a chance that we could bid on Tract 1 together and then divide it up later. But Jill had this worried look on her face when we parted that day. They had that other property with Jim’s parents. How could they tell them they were interested in a new piece of property? We both said we would pray about the situation and hoped that God would lead us in the right direction. Jill & Jim said they would talk about the property together and get back with us later that week so we could make plans whether to attend the auction the evening of Tuesday, October 7. Bill and I drove 3-1/2 hours home that evening and chatted excitedly the whole way back thinking of all the possibilities. 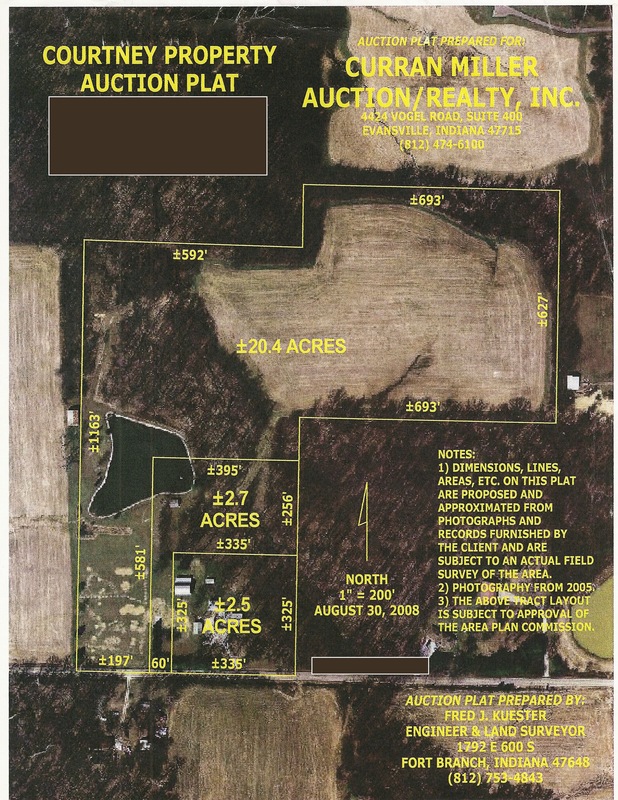 We knew nothing about land auctions and wondered how high the bids would go for each tract. Needless to say, we were on a high the next couple of days anxiously waiting to hear from Jill and Jim. I’ve decided to create a blog to document our retirement life and all the new adventures to come – like selling our home and building a custom home 170 miles away. Here’s a little background. 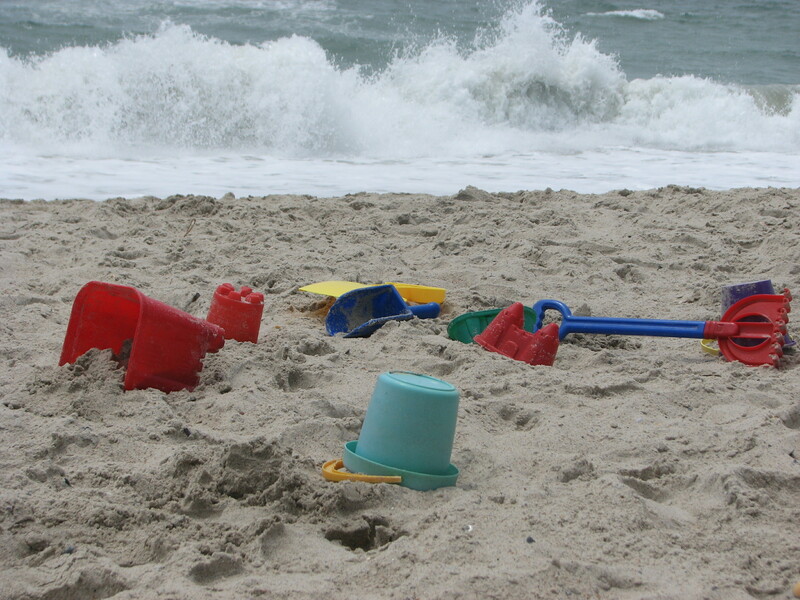 It all began during our 2008 summer family vacation at Emerald Isle, NC. Bill and I had always talked about retiring and living by some beach in North Carolina. We loved vacationing up and down the coast when our two children were little and then again when our children were married and had families of their own. Living in Indiana we craved the ocean sounds, the smells, the waves, and the fishing that were so delightful when we took these trips. So, during this summer trip with 3-6 years before our retirement dates, Bill and I found a house for sale in one of the real estate magazines and decided to call the realtor and scheduled a time to look at the house during the week. When we pulled up to the home, I couldn’t picture myself living there. It was a long modular house with a front porch the length of the whole place. And, it looked just like a trailer. I’m not a snob, but Bill has always teased me that he would buy me a big ‘ol trailer that we could live in during our golden years. This was not the dream retirement home I had envisioned. The asking price was $250,000. That’s how it began. We spent quite a bit of the summer of 2008 down in SW Indiana looking at property. We always had the intention to build because we wanted some acreage. Then one day while Bill was searching online he found some property which was going up for auction. He called Jill and Jim and asked if they knew where it was and their opinion of the location. Jim reported back in a couple days that he had driven out to the area and he felt it was a beautiful piece of property. However the property was being sold in three different tracts and we’d have to decide which of the three tracts we might want to bid on. We got excited and planned a trip to look at the property at the open house on September 28, 2008.